Go to original pattern for design DROPS 76-9. 100-100-150-150-150 gr nr 09, flint. 100-100-100-100-100 gr nr 06, natural white. Gauge: 15 sts x 21 rows with 1 strand Silke-Tweed + 1 strand Vivaldi on larger needles in stockinette st = 10 x 10 cm. 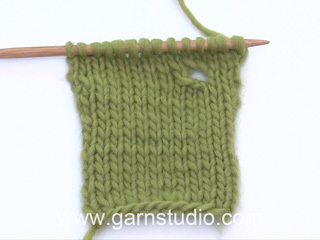 After 4 sts: Slip 1 st as if to knit, K 1, psso. Before 4 sts: K 2 tog. Front: Read the entire section before knitting. Sizes XS + XL: K 1 (edge st knit in garter st), P 1, continue with rib - see instructions above - finish with K 2, P 1, K 1 (edge st knit in garter st). Sizes S + M + L: K 1 (edge st knit in garter st), K 1, P 2, continue with rib - see instructions above - finish with K 1, K 1 (edge st knit in garter st). When the piece measures 4 cm change to larger needles. Knit the next row as follows from edge (seen from the right side): K 1 (edge st), 9-11-11-15-17 sts rib (continue rib as before), 46-46-50-50-50 sts stockinette st, 9-11-11-15-17 sts rib (start with P 2), K 1 (edge st), decreasing 2 sts evenly distributed in the stockinette st part on the 1st row = 44-44-48-48-48 sts stockinette st = 64-68-72-80-84 sts. Continue in rib/stockinette pattern as established. Armhole: When the piece measures 34-35-36-37-38 cm bind off for armhole at each side every other row: 3 sts 1-1-1-2-2 times, 2 sts 0-1-1-2-3 times and 1 st 3-3-3-2-2 times. When all sts for armhole have been bound off, 4 sts rib (= K 2, P 2) remain at each side. 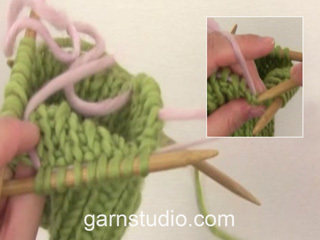 Knit these 4 sts in garter st up along armhole to finished measurements. Neckband: At the same time when the piece measures 34-36-38-38-40 cm divide piece at center front for V-neck and knit each side separately. Put the first half of sts on a st holder (the left side as the garment is worn). Then knit the 4 sts at neck edge in garter st and dec for the neck inside the 4 sts - see knitting tips - dec 1 st every other row a total of 6-6-7-7-7 times and then 1 st every 4 rows a total of 4 times.After all armhole and neck shaping is complete 16-16-17-17-17 sts remain on shoulder. Continue with 4 sts in garter st for the neck and 4 sts in garter st at armhole. Bind off when the piece measures 54-56-58-60-62 cm. Put sts from st holder back on needles and knit right side. Note: knit the 1st row from the center front, from wrong side. Start by picking up 1 st in the first st. This is for the lower edge of V-neck. Back: Cast on and knit the same as the front. Bind off for armhole as on front = 52-52-56-56-56 sts. Continue until the piece measures 52-54-56-58-60 cm. Now knit 2 rows garter st over the center 26-26-28-28-28 sts. On the next row bind off the center 18-18-20-20-20 sts for the neck. On the next row dec 1 st at each neck edge - see knitting tips = 16-16-17-17-17 sts remain on each shoulder. Bind off when the piece measures 54-56-58-60-62 cm. Assembly: Sew shoulder seams. Sew side seams using edge sts as seam allowance. 300-300-350-400-400 gr nr 01, natural. 200-250-250-300-300 gr nr 06, natural white. Gauge: 15 sts x 21 rows with 1 strand Silke-Tweed + 1 strand Vivaldi in stockinette st = 10 x 10 cm. Before the collar sts: K 2 tog. Back: Cast on 80-86-92-98-104 sts with 1 strand each Silke-Tweed and Vivaldi. Knit garter st for 5 cm, then knit Pattern 1, then Pattern 2, then stockinette st to finished measurements. When the piece measures 25 cm dec 1 st at each side every 10 cm a total of 3 times = 74-80-86-92-98 sts. When the piece measures 52-53-54-55-56 cm bind off for armhole at each side every other row: 4 sts 1 time, 3 sts 0-0-1-1-1 time, 2 sts 1-2-2-3-4 times and 1 st 3 times = 56-58-58-60-62 sts. When the piece measures 70-72-74-76-78 cm bind off the center 20 sts for the neck. On the next row dec 1 st at each neck edge = 17-18-18-19-20 sts remain on each shoulder. Bind off when the piece measures 72-74-76-78-80 cm. Left front: Cast on 45-48-51-54-57 sts with 1 strand Silke-Tweed + 1 strand Vivaldi. Knit garter st for 5 cm, then knit Pattern 1, then Pattern 2, keeping 5 sts at center front edge in garter st throughout for buttonband. After Pattern 2 continue in stockinette st. When the piece measures 25 cm dec 1 st at the side every 10 cm 3 times = 42-45-48-51-54 sts. 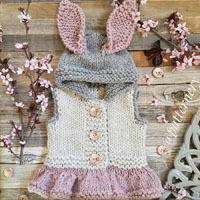 Collar: When the piece measures 49-50-51-52-53 cm inc 2 sts inside of the outermost edge st at the center front - knit the increased sts in garter st. So that the collar will fold, knit 2 short rows of garter st over only the outer 7 sts at the center front. On the next row knit all sts again - at the same time inc 1 st inside the outermost edge st every row 6 times, every other row 6 times and then every 4 rows 6 times = a total of 20 sts increased for collar - knit the increased sts in garter st.
Armhole: At the same time when the piece measures 52-53-54-55-56 cm bind off for armhole at the side as on back. Neckband: At the same time when the piece measures 53-54-55-56-57 cm shape neckline (continue to inc for collar) as follows: dec 1 st inside all the sts in garter st (= 5 edge sts + all the increased sts for collar) every other row 16 times - see knitting tips. When the piece measures 72-74-76-78-80 cm bind off shoulder sts + the innermost 5 garter st sts (= 17-18-18-19-20 sts). There are now only the garter st collar sts remaining on needles = 20 sts. Collar: The collar is sewn at center back afterwards. Continue with garter st over the 20 sts as follows: * 2 rows garter st over all sts, 2 rows garter st over only the outer 15 sts (at the center front edge) *, repeat from * - * until the collar measures approx. 7.5 cm (to center back). Put sts on a st holder. Right front: Cast on and knit the same as the left, reversing all shaping. Make buttonholes along button bands. 1 buttonhole = bind off center buttonband st and on the next row yo over the bound off st. Size S: 15, 24, 33, 42 and 51 cm. Size M: 16, 25, 34, 43 and 52 cm. Size L: 17, 26, 35, 44 and 53 cm. Size XL: 18, 27, 36, 45 and 54 cm. Size XXL: 19, 28, 37, 46 and 55 cm. Sleeve: Cast on 37-38-39-40-41 sts with 1 strand Silke-Tweed + 1 strand Vivaldi. Knit garter st for 12 cm, then knit Pattern 1. Then knit Pattern 3 to finished measurements. 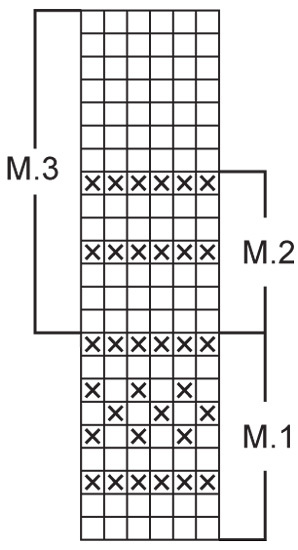 At the same time when the piece measures 14-14-15-16-16 cm inc 1 st at each side every 3.5-3-2.5-2-2 cm a total of 10-11-12-13-14 times = 57-60-63-66-69 sts. When sleeve measures 49-48-47-45-44 cm bind off for sleeve cap at each side every other row: 3 sts 1 time, 2 sts 3-3-2-1-1 times, 1 st 1-4-7-11-11 times, then bind off 2 sts at each side until the piece measures 57-57-58-58-58 cm, then bind off 3 sts 1 time. The piece measures approx. 58-58-59-59-59 cm, bind off the remaining sts. Assembly: Sew shoulder seams. Sew the collar at center back. Sew the collar to neckband on back with the seam on right side so it does not show when collar folds out. Sew in sleeves, sew sleeve and side seams using edge sts as a seam allowance. Sew on buttons. Belt: Cast on 8 sts with 1 strand Silke-Tweed + 1 strand Vivaldi. Knit garter st until belt measures approx. 120-150 cm, bind off. Bonjour Filliat, les indications des manches sont justes, les augmentations sont toutes terminées quand on rabat les premières mailles pour l'arrondi de la manche. Il doit y avoir une erreur dans les explications des manches : si je suis, il faut que je commence à diminuer alors que je n'ai pas fini d'augmenter!! !